The incident occurred Monday morning at the Airport Variety convenience store. 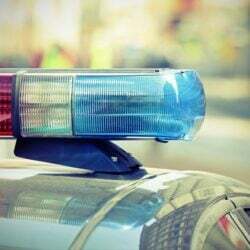 A young man was arrested by police during Monday’s snowstorm after he allegedly wielded a sword during a convenience store robbery in Sanford. Police Sgt. Matthew Jones said the suspect, Shamus Malone, 18, of Sanford entered the Airport Variety store in south Sanford shortly before 10 a.m.
Store personnel told police that Malone showed what appeared to be a knife before fleeing with stolen alcohol and cigarettes. 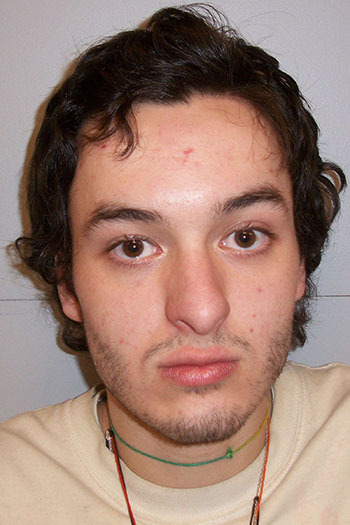 Sanford police later determined that Malone had been in possession of a 2½-foot-long sword. After Malone left the store, Jones said that “vigilant” witnesses told police he went into a wooded area on Airport Road before entering the Whispering Pines apartment complex. Police went to the apartment complex and located Malone in one of the apartments. He surrendered without resistance. Police recovered the sword, which had been thrown into a snowbank at the apartment complex. 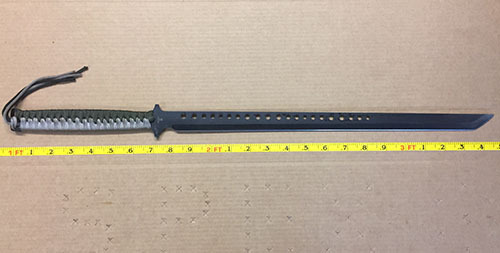 Police say Shamus Malone used this sword to rob a convenience store in Sanford. Jones said Malone was charged with robbery. He also charged in connection with a theft at Lil Mart in Sanford early Monday. Malone did not use a weapon in the Lil Mart theft, according to police. Malone is being held at the York County Jail on $5,000 cash bail.